The memorial stands on the Green, in Front Street. It takes the form of a a base surmounted by segmented column with the inscription on one face and names on the other three faces with a wreath, with a sword, on the 6 o’clock face. The Stonemason was J. Mullen and the memorial was first unveiled and dedicated around 28 August 1938; the unveiling and dedication were attended by local clergy and dignitaries. 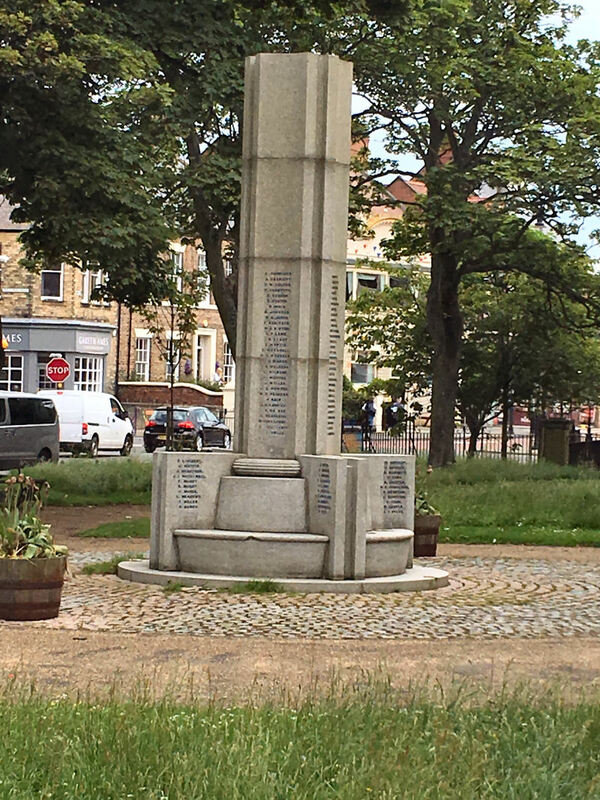 In 1999 the village raised funds to have the World War 2 names added to the memorial; they were added by November. There are 82 names lised for World War 1 and 79 for World War 2. The names have been sorted into alphabetical order within conflict. Private 21/27, 21st (Tyneside Scottish) Battalion, Northumberland Fusiliers. Died 1 July 1916. Son of the late Tom and Am Aggett; husband of Ada Aggett, of 45, Percy St. Tynemouth. No known grave. Commemorated on THIEPVAL MEMORIAL, Somme, France. Pier and Face 10 B 11 B and 12 B. Sergeant G/73110, 4th Battalion, Royal Fusiliers (City of London Regiment). Killed in action 21 March 1918. Aged 25. Resident Tynemouth, enlisted North Shields. Son of William John and Catherine Allen, of 6, Collingwood Terrace, North Shields. No known grave. Commemorated on ARRAS MEMORIAL, Pas de Calais, France. Bay 3.
either Joseph Brown, First Mate, S.S. "Eros" (London), Mercantile Marine. Died 17 August 1918. Aged 52. Born at North Shields. Son of John H. and Margaret Brown (nee Wilkinson), of 6, Argyle St., Tynemouth. No known grave. Commemorated on TOWER HILL MEMORIAL, London. or John Brown, Private 20/1481, 20th Battalion (Tyneside Scottish), Northumberland Fusiliers. Killed in action 1 July 1916. Born Tynemouth, Northumberland, enlisted North Shields. No known grave. Commemorated on THIEPVAL MEMORIAL, Somme, France. Pier and Face 10 B 11 B and 12 B. Acting Sergeant 51668, 103rd Field Company, Royal Engineers. Died of wounds 17 June 1916. Born Newcastle-On-Tyne, resident Tynemouth, Northumberland, enlisted North Shields, Northumberland. Buried in DRANOUTRE MILITARY CEMETERY, West-Vlaanderen, Belgium. Plot I. Row F. Grave 8. Captain, Royal Army Service Corps attached to Royal Garrison Artillery. Died 12 April 1918. Aged 22. Born at Tynemouth, Northumberland. Son of Frank and Gertrude Christie, of 5, Sinclair Gardens, West Kensington, London. Awarded the Military Cross (M.C.). Buried in VAILLY BRITISH CEMETERY, Aisne, France. Plot IV. Row A. Grave 18. Able Seaman Tyneside Z/3189, Hood Battalion, Royal Naval Division, Royal Naval Volunteer Reserve. Killed or died as a direct result of enemy action 13 November 1916. Born 25 December 1895. Wounded 6 January 1916, admitted to 19th General Hospital, Alexandria 9 December 1915 with gunshot wounds to the left thigh and right hand, transferred to 6 Convalescent Hospital, Ramelh, 14 January 1916. Son of Thomas Crow, of 48 Percy Street, Tynemouth, Northumberland. Religious denomination Church of England. Formerly an Apprentice Moulder. height 5 feet 4½ inchesm chest 32 inches, medium complexion, dark hair, brown eyes. Buried in ANCRE BRITISH CEMETERY, BEAUMONT-HAMEL, Somme, France. Plot III. Row C. Grave 8. Private 51464, 1st Battalion, Northumberland Fusiliers. Killed in action 28 March 1918. Enlisted Tynemouth, Northumberland. No known grave. Commemorated on ARRAS MEMORIAL, Pas de Calais, France. Bay 2 and 3. First Engineer, M.V. "Arabis" (London), Mercantile Marine. Died 16 September 1917. Aged 44. Born at North Shields. Son of the late William Bailey Cutter and Catherine Cutter; husband of Mary Hannah Cutter (nee Lightbown), of 7, Albury Park Rd., Tynemouth, North Shields. No known grave. Commemorated on TOWER HILL MEMORIAL, London. Lance Corporal 10019, "A" Company, 11th Battalion, Northumberland Fusiliers. Died 18 July 1916. Aged 25. Son of John George Davis, of 37, Edith St., Tynemouth, Northumberland, and the late Charlotte Davis. Enlisted September 1914. No known grave. Commemorated on THIEPVAL MEMORIAL, Somme, France. Pier and Face 10 B 11 B and 12 B. Ordinary Seaman Tyneside Z/3191, 5th Battalion, Royal Naval Division, Royal Naval Volunteer Reserve. Died 6 February 1915. Born 6 March 1894. Resident 22, Stephenson Street, Tynemouth, Northumberland. Son of Emily Davison of 76, Lower Queen treet, Sutton Coldfield, Warwickshire. Religious denomination Chruch of England. Formerly employed as a Butcher. Height 5 feet 2 inches, chest 32 inches, dark complexion, dark hair, blue eyes. Buried in BECKENHAM CREMATORIUM AND CEMETERY, Kent. Grave rreference: W4. 6808. Private 119928 [SDGW] or 118928 [CWGC], 6th Stationary Hospital, Royal Army Medical Corps. Died in service 29 October 1918. Born Newcastle-On-Tyne, resident Tynemouth, enlisted North Shields. Buried in FILLIEVRES BRITISH CEMETERY, Pas de Calais, France. Row A. Grave 43. Silver Badge issued to John Fletcher, Gunner 376067, Royal Garrison Artillery (Tynemouth). Enlisted 7 january 1909, discharged, aged 32, 9 April 1919 Para 392 (xvia) King's Regulation, badge no 463106 issued 30 March 1920. Private 225574, 1st Battalion, East Yorkshire Regiment. Died of wounds 27 August 1918. Aged 21. Born Blyth, Northumberland, resident Tynemouth, enlisted North Shields. Only son of Daniel and Margaret Banks Graham, of 5, Huntingdon Place, Tynemouth, Northumberland. Formerly 29094, Northumberland Fusiliers. Buried in FIENVILLERS BRITISH CEMETERY, Somme, France. Row C. Grave 9. Private 77105 [CWGC] or 77125 [SDGW], Royal Fusiliers posted to 2nd/2nd Battalion, London Regiment (Royal Fusiliers). Killed in action 26 August 1918. Aged 18. Born and resident Tynemouth, enlisted North Shields. Son of Edith Graham, of 23, Percy Gardens, Tynemouth, Northumberland, and the late Joseph Graham. Formerly 96264, Royal Flying Corps. Buried in PERONNE ROAD CEMETERY, MARICOURT, Somme, France. Grave lost. Special memorial Row A. Grave 7. Sapper 152139, 18th Division Signal Company, Royal Engineers. Died from pneumonia 11 July 1918. Aged 21. Born and resident Tynemouth, Northumberland. Son of George Henry and Alice Grey, of Tynemouth, Northumberland. Originally employed as a Clerk at the Operating Department, Tyne Dock, North Eastern Railway; he started working for the North Eastern Railway in November 1912, and enlisted May 1916 in North Shields, Northumberland. Buried in TERLINCTHUN BRITISH CEMETERY, WIMILLE, Pas de Calais, France. Plot I. Row E. Grave 38. Private 42916, 2nd/6th Battalion, North Staffordshire Regiment. Died 15 April 1918. Aged 19. Son of Albert and Elizabeth Harris, of 51, Percy Gardens, Tynemouth. No known grave. Commemorated on PLOEGSTEERT MEMORIAL, Hainaut, Belgium. Panel 8. Private 4336, 8th Battalion, Northumberland Fusiliers. Died 7 August 1915. Aged 35. Son of Mrs. Ely Harrison, of 47, Percy St., Tynemouth. No known grave. Commemorated on HELLES MEMORIAL, Turkey (including Gallipoli). Panel 34 to 36. Private 2278, 1st/6th Battalion, Northumberland Fusiliers. Died 10 May 1915. Aged 21. Son of Walter George and Mary Ann Holmes (nee Harvey), of Shipley Rd., Tynemouth. Buried in BOULOGNE EASTERN CEMETERY, Pas de Calais, France. Plot VIII. Row C. Grave 21. Able Seaman Tyneside Z/5617 (Ch), H.M.S. "Hampshire", Royal Naval Reserve. Killed or died as a direct result of enemy action 5 June 1916. Husband of Charlotte L. Hunter, of 59 Percy Street, Tynemouth. No known grave. Commemorated on CHATHAM NAVAL MEMORIAL, Kent. Panel 20. Private 42358, 1st Battalion, Lincolnshire Regiment. Killed in action 4 October 1917. Aged 19. Born and resident Tynemouth, Northumberland, enlisted North Shields. Son of Mr. and Mrs. Robert Warden Irwin, of 57, Percy St., Tynemouth, North Shields. No known grave. Commemorated on TYNE COT MEMORIAL, West-Vlaanderen, Belgium. Panel 35 to 37 and 162 to 162A. Private 2355489, 1st Battalion, Canadian Infantry. Died 1 October 1918. Aged 25. Son of James and Isabella Jackson, of 7, Mariners Homes, Tynemouth. Buried in SANCOURT BRITISH CEMETERY, Nord, France. Plot I. Row C. Grave 18. Private 41870, 1st Battalion, Prince of Wales's Own (West Yorkshire Regiment). Killed in action 27 May 1917. Aged 19. Born Tamworth, Staffordshire, resident Tynemouth, enlisted Newcastle-On-Tyne. Son of William and Caroline Jones. Formerly 43200, Northumberland Fusiliers. Buried in PHILOSOPHE BRITISH CEMETERY, MAZINGARBE, Pas de Calais, France. Plot I. Row Q. Grave 9. Lieutenant, 2nd Battalion, Prince of Wales's Own (West Yorkshire Regiment) transferred to Labour Corps. Died 13 May 1918. Aged 31. Son of Mrs. M. V. Kydd, of Arbroath, and the late Mr. Kydd; husband of Ellen Isabel Naysmith Kydd, of 40, Percy Gardens, Tynemouth. Buried in TYNEMOUTH (PRESTON) CEMETERY, Northumberland. Plot/Section A. Row C. Grave 911. Private 40643, 1st Battalion, South Staffordshire Regiment. Killed in action 19 April 1917. Born Cullercoats, Northumberland, resident Tynemouth, Northumberland, enlisted Newcastle-On-Tyne, Northumberland. No known grave. Commemorated on ARRAS MEMORIAL, Pas de Calais, France. Bay 6. Private 12332, "B" Company, 9th Battalion, Northumberland Fusiliers. Died in service 7 July 1916. Aged 20. Born Tynemouth, Northumberland, enlisted Newcastle-On-Tyne. Son of William Edward and Sarah Lamb, of 1, Newcastle Terrace, Tynemouth. No known grave. Commemorated on THIEPVAL MEMORIAL, Somme, France. Pier and Face 10 B 11 B and 12 B. Private 42547, 1/7th Battalion, Manchester Regiment. Killed in action 27 September 1918. Born Shiremoor, Northumberland, resident Tynemouth, Northumberland, enlisted North Shields, Durham. No known grave. Commemorated on VIS-EN-ARTOIS MEMORIAL, Pas de Calais, France. Panel 9. Able Seaman Tyneside Z/2628, Anson Battalion, R.N. Division, Royal Naval Volunteer Reserve. Killed in action 28 May 1917. Aged 20. Born 8 February 1896. Son of Elizabeth H. M. Crawshaw (formerly Mullen), of 2, Well Close, Tynemouth, North Shields, and the late Dominic Mullen. Religious denomination Wesleyan. Formerly employed as a Labourer. Height 5 feet 8¼ inches, chest 33 inches, complexion fresh, dark hair, blue eyes. Buried in ORCHARD DUMP CEMETERY, ARLEUX-EN-GOHELLE, Pas de Calais, France. Plot IX. Row C. Grave 24. Lance Corporal 40962, 2nd Battalion, Prince of Wales's Own (West Yorkshire Regiment). Killed in action 4 May 1917. Aged 22. Born Tynemouth, Northumberland, enlisted North Shields. Son of Mary Jane Newton, of 87, Stephenson St., North Shields, and the late John Newton. Formerly 22102, Northumberland Fusiliers. No known grave. Commemorated on THIEPVAL MEMORIAL, Somme, France. Pier and Face 2 A 2 C and 2 D.
Private 8537, 1st Battalion, Northumberland Fusiliers. Killed in action 17 September 1916. Born Tynemouth, Northumberland, enlisted North Shields. Buried in PHILOSOPHE BRITISH CEMETERY, MAZINGARBE, Pas de Calais, France. Plot I. Row G. Grave 6. Second Lieutenant, 16th Battalion attached to 18th Battalion, Durham Light Infantry. Died 2 July 1916. Aged 19. Son of George and Elizabeth J. Raine, of 61, Percy Park, Tynemouth. Commissioned November 1914. Previously wounded at Hooge in 1915, whilst attached to 2nd Battalion, Durham Light Infantry. Buried in GEZAINCOURT COMMUNAL CEMETERY EXTENSION, Somme, France. Plot I. Row A. Grave 11. Second Lieutenant, 14th Battalion, Durham Light Infantry. Died 17 October 1915. Aged 22. Son of James S. and M. M. Raynes, of Tynemouth. Buried in LE TREPORT MILITARY CEMETERY, Seine-Maritime, France. Plot 2. Row O. Grave 26. Private 155770, 63rd Battalion, Machine Gun Corps (Infantry). Died of wounds 14 September 1918. Aged 22. Born and resident Tynemouth, Northumberland, enlisted North Shields. Son of Robert and Mary E. A. Smith, of Tynemouth, Northumberland. Formerly 1236, Durham Light Infantry. Buried in BOIS-GUILLAUME COMMUNAL CEMETERY EXTENSION, Seine-Maritime, France. Row F. Grave 19B. Fireman, S.S. "Powhatan" (Sunderland), Mercantile Marine. Died 6 April 1917. Aged 39. Born at Tynemouth. Son of the late Thomas and Hannah Rowley; husband of Sarah Jane Rowley. No known grave. Commemorated on TOWER HILL MEMORIAL, London. Private 14/498, 19th Battalion (Tyneside Pioneers), Northumberland Fusiliers. Died in service 21 October 1917. Aged 25. Born Tynemouth, Northumberland, resident North Shields. Son of George and Annie Shand, of 12, Percy St., Tynemouth, Northumberland. Buried in ARNEKE BRITISH CEMETERY, Nord, France. Plot I. Row A. Grave 1. Gunner 34635, 35th Siege Battery, Royal Garrison Artillery. Killed in action 4 November 1918. Aged 25. Born Clerkenwell, Middlesex, resident Tynemouth, Northumberland, enlisted London. Husband of Bertha Escott (formerly Stone), of 40, Rudyard St., North Shields. Buried at RUESNES COMMUNAL CEMETERY, Nord, France. Plot II. Row C. Grave 2. Lieutenant, 4th Battalion attached to 1st/7th Battalion, Northumberland Fusiliers. Died 15 September 1916. Aged 20. Son of John G. and Suzanne Stroud, of 1, Albury Park Rd., Tynemouth, North Shields. No known grave. Commemorated on THIEPVAL MEMORIAL, Somme, France. Pier and Face 10 B 11 B and 12 B.
Captain, Royal Flying Corps and Border Regiment. Died 22 May 1917. Aged 24. Son of John and Jane Eleanor Tailford, of Tynemouth, Northumberland; husband of Elsie Marion Tailford, of 20, Delaware Mansions, Maida Vale, London. Awarded the Military Cross (M.C. ), Mentioned in Despatches. Buried in DOVER (ST. JAMES'S) CEMETERY, Kent. Plot/Section W. Row D. Grave 4. Engineer Lieutenant, R.F.A. "Industry", Royal Naval Reserve. Died 18 October 1918. Aged 42. Husband of Esther Ann Tait, of 5, Albury Park Rd., Tynemouth, Northumberland. No known grave. Commemorated on PORTSMOUTH NAVAL MEMORIAL, Hampshire. Panel 30. Private 20498, 1st Battalion, Border Regiment. Killed in action 19 May 1917. Aged 21. Born and resident Tynemouth, Northumberland, enlisted North Shields, Durham. Son of George and Isabella Taylor, of The Lodge, Tynemouth Park, Tynemouth. No known grave. Commemorated on ARRAS MEMORIAL, Pas de Calais, France. Bay 6. Stoker 1st Class K/22857, H.M. Submarine "E.26", Royal Navy. Killed or died as a direct result of enemy action 6 July 1916. Aged 24. Born 27 January 1892 in Tynemouth. Son of the late Angus Thompson, of 2, Oliver's Court, Tynemouth; husband of May Taylor (formerly Thompson), of 2, Wells Square, Percy St., Tynemouth. No known grave. Commemorated on CHATHAM NAVAL MEMORIAL, Kent. Panel 17. Private 42541, 2nd/10th Battalion, Manchester Regiment. Killed in action 9 October 1917. Aged 29. Born Norwich, resident Tynemouth, Northumberland, enlisted North Shields, Northumberland. Son of William and Sarah Todd; husband of Isabella H. Todd, of 73, Percy St., Tynemouth, North Shields. Buried in TYNE COT CEMETERY, West-Vlaanderen, Belgium. Plot XV. Row F. Grave 21. Private 23607, 8th Battalion, North Staffordshire Regiment. Died of wounds 14 May 1917. Aged 22. Born and resident Tynemouth, Northumberland, enlisted North Shields. Son of Foster and Anne Tombling, of Tynemouth. Formerly 23117, Northumberland Fusiliers. Buried in VARENNES MILITARY CEMETERY, Somme, France. Plot I. Row K. Grave 7. Corporal 16/670, 16th Battalion, Northumberland Fusiliers. Killed in action 1 July 1916. Aged 25. Born Tynemouth, Northumberland, enlisted Newcastle-On-Tyne. Son of Mr. and Mrs. F. Tombling, of 25, Edith St., Spittal Drive, North Shields, Tynemouth. Buried in LONSDALE CEMETERY, AUTHUILLE, Somme, France. Plot III. Row U. Grave 10. Major, 6th Battalion, East Lancashire Regiment. Died 5 February 1917. Aged 28. Son of Reuben Herbert and Susannah Ann Treadwell, of Tynemouth, Northumberland. No known grave. Commemorated on BASRA MEMORIAL, Iraq. Panel 19. Private 16593, 8th Battalion, Northumberland Fusiliers. Died in service 19 August 1915. Born Tynemouth, enlisted North Shields. No known grave. Commemorated at HELLES MEMORIAL, Turkey (including Gallipoli). Panel 34 to 36. Captain, 1st Battalion, Prince of Wales's Own (West Yorkshire Regiment). Died 18 April 1918. Aged 34. Son of Auburn and Henrietta Wilkinson, of Tynemouth, Northumberland. Buried in BRANDHOEK NEW MILITARY CEMETERY NO.3, West-Vlaanderen, Belgium. Plot II. Row O. Grave 10. Warrant Officer Class 2 (Company Serjeant Major) 18405, 15th Battalion, Durham Light Infantry. Killed in action 1 July 1916. Born Tynemouth, Northumberland, resident Wallsend-On-Tyne, enlisted Newcastleon-Tyne. No known grave. Commemorated on THIEPVAL MEMORIAL, Somme, France. Pier and Face 14 A and 15 C.
Private 46502, 15th Battalion, Durham Light Infantry. Killed in action 26 August 1918. Aged 19. Born and resident Tynemouth, enlisted North Shields. Son of James and Ellen Woods, of 23, Algernon Terrace, Tynemouth, Northumberland. No known grave. Commemorated on VIS-EN-ARTOIS MEMORIAL, Pas de Calais, France. Panel 9. Private 376204, 18th Battalion, Durham Light Infantry. Killed in action 19 July 1918. Born islington, London, resident Tynemouth, enlisted Newcastle-On-Tyne. Formerly 4783, East Yorskhire Regiment. No known grave. Commemorated on PLOEGSTEERT MEMORIAL, Hainaut, Belgium. Panel 8 and 9. [Listed as YOULDS on CWGC] Lance Corporal 10810, 9th Battalion, Prince of Wales's Own (West Yorkshire Regiment). Killed in action at Gallipoli 9 August 1915. Aged 19. Born Byker, Haxham, resident Tynemouth, enlisted North Shields. Son of Nicholas and Rose Ann Youlds, of 25, Bewick Rd., Willington Quay, Northumberland. No known grave. Commemorated on HELLES MEMORIAL, Turkey (including Gallipoli). Panel 47 to 51. Lieutenant 233244, Royal Scots Fusiliers attached 1st Battalion, Gordon Highlanders. Died 27 August 1943. Aged 21. Son of John Laws Angus and Mabel Isabella Angus, of Tynemouth, Northumberland. Buried in HELIOPOLIS WAR CEMETERY, Egypt. Plot 5. Row J. Grave 9. Corporal 4274239, 9th Battalion, Royal Northumberland Fusiliers. Died 25 May 1940. Aged 30. Son of Clemount and Rose Aries; husband of Doreen Louvaine Aries, of Tynemouth, Northumberland. Buried in ST. MOMELIN COMMUNAL CEMETERY, Nord, France. Flight Lieutenant (Pilot) 47360, 405 (R.C.A.F.) Squadron, Royal Air Force. Died 1 May 1943. Aged 26. Son of Herbert and Isabella Beatrice Atkinson, of Tynemouth, Northumberland; husband of Stella Constance Atkinson. Buried in UDEN WAR CEMETERY, Noord-Brabant, Netherlands. Plot 4. Row E. Grave 12. Rifleman 14757429, 1st Battalion, Royal Ulster Rifles. Died 11 August 1947. Son of Andrea and Doris Azzopardi, of Tynemouth, Northumberland. Buried in RAMLEH WAR CEMETERY, Israel and Palestine (including Gaza). Plot 9. Row K. Grave 8. Private 2184760, Pioneer Corps. Died 31 March 1945. Aged 40. Son of Mr. and Mrs. Amor Bell; husband of Drusilla Mary Bell, of Tynemouth. Buried in TYNEMOUTH (PRESTON) CEMETERY, Northumberland. Section K. Grave 14513. Private 14348728, 1st Battalion The London Scottish, Gordon Highlanders. Died 1 October 1944. Aged 20. Son of George Hudson Bell and Mary Josephine Bell, of Tynemouth, Northumberland. Buried in FORLI WAR CEMETERY, Italy. Plot II. Row C. Grave 9. Chief Engineering Officer, M.V. San Demetrio (London), Merchant Navy. Died 17 March 1942. Aged 42. Son of Henry Guy and Elizabeth Ann Black, of Tynemouth, Northumberland; husband of Meggie Fairhurst Black, of South Shields, Co. Durham. King's Commendation for Brave Conduct. No known grave. Commemorated on TOWER HILL MEMORIAL, London. Panel 92. Sergeant 1055959, 58 Squadron, Royal Air Force Volunteer Reserve. Died 24 April 1945. Aged 24. Son of R. and Beatrice Blakey, of Tynemouth, Northumberland. No known grave. Commemorated on RUNNYMEDE MEMORIAL, Surrey. Panel 273. Bombardier 900280, 124 Field Regiment, Royal Artillery. Died 19 April 1945. Aged 25. Son of Charles and Alice May Brannen, of Tynemouth, North Shields, Northumberland. Buried in DURNBACH WAR CEMETERY, Bayern, Germany. Plot 3. Row C. Grave 6. Corporal 1156597, Royal Air Force Volunteer Reserve. Died 28 October 1943. Aged 23. Son of John and Lilian Annie Bridger, of Tynemouth, Northumberland. Buried in ALEXANDRIA (HADRA) WAR MEMORIAL CEMETERY, Egypt. Plot 5. Row H. Grave 1. Assistant Steward, S.S. Empire Brigade (Newcastle-on-Tyne), Merchant Navy. Died 19 October 1940. Aged 19. Son of Harry and Hannah Bullas, of Tynemouth, North Shields, Northumberland. No known grave. Commemorated on TOWER HILL MEMORIAL, London. Panel 38. Able Seaman, S.S. Effna, Merchant Navy. Died 1 March 1941. Aged 21. Son of Joseph and Mary Ann Burdon, of Tynemouth, Northumberland. No known grave. Commemorated on TOWER HILL MEMORIAL, London. Panel 37. Captain 109168, 4 Survey Regiment, Royal Artillery. Died 26 August 1942. Aged 24. Son of Fanny Louisa Evelyn Burnett, of Tynemouth, Northumberland. Buried in HELIOPOLIS WAR CEMETERY, Egypt. Plot 2. Row E. Grave 15. Musician 4256661, Coldstream Guards. Died 18 June 1944. Son of George William Henry and Alice Leah Carr; husband of Mary Russell Carr, of Tynemouth, Northumberland. Buried in BROOKWOOD MILITARY CEMETERY, Surrey. Plot 33A. Row B. Grave 7. Private 13088528, 242 Company, Pioneer Corps. Died 13 September 1943. Aged 35. Son of Richard Thomas Chater and Elizabeth Grace Chater, of Tynemouth, North Shields, Northumberland. Buried in SALERNO WAR CEMETERY, Italy. Plot II. Row B. Grave 20. Sergeant 565482, 51 Squadron, Royal Air Force. Died 23 April 1940. Aged 24. Son of Lionel and Violet Grace Compton, of Tynemouth, Northumberland. No known grave. Commemorated on RUNNYMEDE MEMORIAL, Surrey. Panel 12. Corporal 538592, Royal Air Force. Died 20 October 1942. Son of Lionel and Violet G. Compton, of Tynemouth, Northumberland. No known grave. Commemorated on ALAMEIN MEMORIAL, Egypt. Column 263. Gunner 850062, 59 (6th Battalion, The Hampshire Regiment) Anti-Tank Regiment, Royal Artillery. Died 10 July 1944. Aged 28. Husband of Gladys Cook, of Tynemouth, Northumberland. No known grave. Commemorated on BAYEUX MEMORIAL, Calvados, France. Panel 11, Column 2. Sapper 2]81575 [sic], Royal Engineers. Died 7 April 1946. Aged 41. Son of David and Sarah Cooper, of North Shields husband of Isabella Ann Cooper, of Tynemouth. Buried in TYNEMOUTH (PRESTON) CEMETERY, Northumberland. Section K. Grave 15047. Flying Officer 154613, Royal Air Force Volunteer Reserve. Died 10 December 1944. Aged 22. Son of James Boe Cuthbertson and Alice Cuthbertson, of Tynemouth, Northumberland. Buried in MONTREAL (MOUNT ROYAL) CEMETERY, Quebec, Canada. Section G.943. Grave 444. First Radio Officer, S.S. Goolistan (Newcastle-on-Tyne), Merchant Navy. Died 23 November 1942. Aged 23. Son of Francis and Mary Devlin, of Tynemouth, Northumberland. No known grave. Commemorated on TOWER HILL MEMORIAL, London. Panel 53. Major 92241, 5th Battalion, East Yorkshire Regiment. Died 11 June 1944. Aged 29. Son of Norman and Mary Dixon, husband of Muriel Galletly Dixon, of Tynemouth, Northumberland. LL.B., Hons. (Lond.). Buried in HOTTOT-LES-BAGUES WAR CEMETERY, Calvados, France. Plot II. Row F. Grave 12. Flight Sergeant 745531, 458 Squadron, Royal Air Force Volunteer Reserve. Died 15 November 1941. Aged 27. Son of Henry William and Elizabeth Jane Duffield, of Tynemouth, Northumberland. No known grave. Commemorated on RUNNYMEDE MEMORIAL, Surrey. Panel 36. Sergeant 1563183, 256 Squadron, Royal Air Force Volunteer Reserve. Died 7 June 1943. Aged 22. Son of the Revd. Alexander Dunn, M.A., and of Amy Dunn, of Tynemouth, Northumberland. No known grave. Commemorated on RUNNYMEDE MEMORIAL, Surrey. Panel 148. Gunner 950212, 56 Heavy Regiment, Royal Artillery. Died 8 May 1943. Aged 25. Son of Hugh Graig Dunn, and Elizabeth Catherine Ann Dunn, of Tynemouth, Northumberland. Buried in OUED ZARGA WAR CEMETERY, Tunisia. Plot 1. Row F. Grave 19. Cook, S.S. Hartlebury (London), Merchant Navy. Died 7 July 1942. Aged 23. Son of Charles T. and Mary Ellen Dunn, of Tynemouth, Northumberland. No known grave. Commemorated on TOWER HILL MEMORIAL, London. Panel 55. Able Seaman, S.S. Orangemoor (London), Merchant Navy. Died 31 May 1940. Aged 22. Son of Thomas Henry Fairbairn, and of Catherine Fairbairn, of Tynemouth, Northumberland. No known grave. Commemorated on TOWER HILL MEMORIAL, London. Panel 76. Master, S.S. La Brea, Merchant Navy. Died 24 August 1940. Aged 56. Husband of Mary Ann Firth, of Tynemouth, Northumberland. No known grave. Commemorated on TOWER HILL MEMORIAL, London. Panel 62. Sergeant 1480362, 102 Squadron, Royal Air Force Volunteer Reserve. Died 22 January 1944. Aged 20. Son of Leslie George and Isobel Forster, of Tynemouth, Northumberland. No known grave. Commemorated on RUNNYMEDE MEMORIAL, Surrey. Panel 229. Flight Lieutenant (Pilot) 63480, 103 Squadron, Royal Air Force Volunteer Reserve. Died 28 August 1942. Aged 21. Son of Ernest and Charlotte Edith Frith, of Tynemouth, Northumberland. Buried in HAAKSBERGEN GENERAL CEMETERY, Overijssel, Netherlands. Plot 4. Row 1. Grave 5. Steward, S.S. Ramsay (London), Merchant Navy. Died 9 June 1942. Aged 17. Son of William and Hilda Gibson, of Tynemouth, North Shields, Northumberland. No known grave. Commemorated on TOWER HILL MEMORIAL, London. Panel 86. Pilot Officer (Air Gunner) 135412, 16 O.T.U., Royal Air Force Volunteer Reserve. Died 24 March 1943. Aged 23. Son of George William and Norah Gibson, of Tynemouth, Northumberland. Buried in PONTGOUIN COMMUNAL CEMETERY, Eure-et-Loir, France. Grave 1. Squadron Leader 42709, 488 Squadron, Royal Air Force. Died 25 November 1943. Aged 33. Son of Charles and Adeleine Hobbis; husband of Jean Hobbis, of Tynemouth, Northumberland. Awarded the Distinguished Flying Cross (D.F.C.). No known grave. Commemorated on RUNNYMEDE MEMORIAL, Surrey. Panel 118. Engine Room Artificer 1st Class P/224ED, H.M.S. Marne, Royal Naval Reserve. Died 25 August 1942. Son of Frederick and Alice Henderson Hutchinson; husband of Constance Hutchinson, of Tynemouth, Northumberland. No known grave. Commemorated on PORTSMOUTH NAVAL MEMORIAL, Devon. Panel 71, Column 1. Sub-Lieutenant, H.M.S. Quebec, Royal Naval Volunteer Reserve. Died 6 June 1944. Aged 20. Son of James and Evelyn Howey Keys, of Tynemouth, Northumberland. Buried in BAYEUX WAR CEMETERY, Calvados, France. Plot XIV, Row C. Grave 4. Fourth Engineer Officer, M.V. British Splendour (London), Merchant Navy. Died 7 April 1942. Aged 23. Son of George S. and M. C. Lambert, of Tynemouth, Northumberland. No known grave. Commemorated on TOWER HILL MEMORIAL, London. Panel 21. Lance Corporal 7369512, Royal Army Medical Corps. Died between 28 and 29 May 1942. Aged 25. Son of Lt. Ernest Martin, formerly of the Royal Garrison Artillery, and Agnes Ann Martin, of Tynemouth, Northumberland. Buried in KNIGHTSBRIDGE WAR CEMETERY, ACROMA, Libya. Plot 11. Row C. Grave 19. Able Seaman, S.S. Black Osprey, Merchant Navy. Died 18 February 1941. Aged 26. Son of John and Elizabeth McArthur; nephew of Mrs. L. Chapman, of Tynemouth, Northumberland. No known grave. Commemorated on TOWER HILL MEMORIAL, London. Panel 17. Lieutenant 103218, Royal Army Medical Corps attached to 8th Battalion, Sherwood Foresters (Nottinghamshire and Derbyshire Regiment). Died 16 and 28 April 1940. Aged 25. Son of James and Eileen McConnell, of Tynemouth, Northumberland. M.B., B.S. Buried in LILLEHAMMER NORTHERN CIVIL CEMETERY, Norway. Plot I. Row E. Grave 3. Sergeant (Pilot) 1312145, Royal Air Force Volunteer Reserve. Died 9 January 1942. Aged 31. Son of Reginald and Marie McCoy; husband of Marjorie McCoy, of Tynemouth. F.C.I.S. Buried in TYNEMOUTH (PRESTON) CEMETERY, Northumberland. Section K. Grave 14490. Galley Boy, S.S. Kirkpool (West Hartlepool), Merchant Navy. Died 10 April 1942. Aged 18. Son of Michael and Margaret McGee, of Tynemouth, Northumberland. No known grave. Commemorated on TOWER HILL MEMORIAL, London. Panel 62. Second Officer, S.S. Baron Blythswood (Ardrossan), Merchant Navy. Died 20 September 1940. Aged 27. Husband of M. Meadows, of Tynemouth, Northumberland. No known grave. Commemorated on TOWER HILL MEMORIAL, London. Panel 14. Sergeant 1668910, H.Q. 64 A.A. Regiment, Royal Artillery. Died 8 June 1940. Aged 47. Husband of Margaret Miller, of Tynemouth. Buried in the Old ground of SEGHILL (HOLY TRINITY) CHURCHYARD, Northumberland. Section S.2. Grave 5. Stoker LT/X 105005, H.M.S. Europa, Royal Naval Reserve (Patrol Service). Died 11 December 1942. Son of Thomas and Hannah Mundy; husband of Margaret Mundy, of Tynemouth. Buried in TYNEMOUTH (PRESTON) CEMETERY, Northumberland. Section K. Grave 14520. Marine CH/X3321, H.M.S. Warspite, Royal Marines. Died 9 July 1941. Son of Mrs. T. Nichol, of Tynemouth, Northumberland. His brother, Wilfred James Nichol, also died on service (see below). Buried in ALEXANDRIA (HADRA) WAR MEMORIAL CEMETERY, Egypt. Plot 2. Row A. Grave 7. Carpenter's Mate 146170, H.M.S. Dasher, Naval Auxiliary Personnel (Merchant Navy). Died 27 March 1943. Aged 33. Son of Mrs. T. Nichol, of Tynemouth, Northumberland. His brother, William Henry, also died on service (see above). No known grave. Commemorated on LIVERPOOL NAVAL MEMORIAL, Lancashire. Panel 10, Column 2. Lance Corporal 14375622, 6th Airborne Divisional Provost Company, Corps of Royal Military Police. Died 1 March 1947. Aged 23. Son of Robert and Adeline Rayne Ogilvie, of Tynemouth, Northumberland; husband of Irene Ogilvie. Buried in KHAYAT BEACH WAR CEMETERY, Israel and Palestine (including Gaza). Plot D. Row A. Grave 8. Flight Sergeant 566229, Royal Air Force. Died 15 April 1944. Aged 28. Son of Sydney Oscar and Lillian Pascoe, of Tynemouth; husband of Eileen Eugene Pascoe, of llford, Essex. Buried in TYNEMOUTH (PRESTON) CEMETERY, Northumberland. Section K. Grave 14471. Private W/65135, Auxiliary Territorial Service. Died 17 March 1944. Aged 24. Daughter of Walter and Ellan Robson Patterson, of Tynemouth. Buried in TYNEMOUTH (PRESTON) CEMETERY, Northumberland. Section C. Unconsecrated Grave 12947. Able Seaman, M.V. Donovania (London), Merchant Navy. Died 28 August 1941. Aged 24. Son of William and Mary Ellen Peach, of Tynemouth, Northumberland. Buried in MILFORD HAVEN CEMETERY, Pembrokeshire. Section E. Grave 508. Second Lieutenant 124510, 2nd Battalion, Durham Light Infantry. Died 27 May 1940. Aged 22. Son of Theodore John Phillips M.B., B.S., and Hilda Ansom Phillips, of Tynemouth, Northumberland. Buried in HAVERSKERQUE BRITISH CEMETERY, Nord, France. Row EE. Grave 22. Lieutenant (E), H.M.S. Anking, Royal Naval Reserve. Died 4 March 1942. Aged 37. Son of Albert and Annie Phillips, of Tynemouth, Northumberland. No known grave. Commemorated on PLYMOUTH NAVAL MEMORIAL, Devon. Panel 75, Column 1. Flying Officer (Pilot) 122091, 613 Squadron Royal Air Force Volunteer Reserve. Died 13 March 1944. Aged 26. Son of Charles Harrison Pigg and Edith Elsie Pigg, of Tynemouth, North Shields, Northumberland. A.A.I. Buried in ABBEVILLE COMMUNAL CEMETERY EXTENSION, Somme, France. Plot 6. Row H. Grave 4. Second Engineer Officer, M.V. Chinese Prince (London), Merchant Navy. Died 12 June 1941. Aged 27. Son of William and Ann Pledger; nephew of Mrs. M. A. Holmes, of Tynemouth, Northumberland. No known grave. Commemorated on TOWER HILL MEMORIAL, London. Panel 28. Aircraftman 2nd Class 1641385, Royal Air Force Volunteer Reserve. Died 24 October 1942. Husband of Jane Ann Hodgson Prince, of Tynemouth. Buried in TYNEMOUTH (PRESTON) CEMETERY, Northumberland. Section E. Consecrated Grave 6522.E. [Transcribed as REES] Master, M.V. Western Prince (London), Merchant Navy. Died 14 December 1940. Aged 57. Son of John and Annie Reed; husband of Effie Reed, of Tynemouth, Northumberland. No known grave. Commemorated on TOWER HILL MEMORIAL, London. Panel 118. Greaser, S.S. Ashworth (Newcastle-on-Tyne), Merchant Navy. Died 13 October 1942. Aged 57. Husband of Agnes J. Reis, of Tynemouth, North Shields, Northumberland. No known grave. Commemorated on TOWER HILL MEMORIAL, London. Panel 11. Sergeant (Air Bomber) 1502388, 78 Squadron, Royal Air Force Volunteer Reserve. Died 22 March 1944. Aged 23. Son of Richard Edmund Wetherall Renwick and Doris Ida Renwick, of Tynemouth, Northumberland. Buried in RHEINBERG WAR CEMETERY, Nordrhein-Westfalen, Germany. Plot 8. Row F. Grave 11. Driver T/113844, Royal Army Service Corps. Died 20 May 1940. Aged 21. Son of Henry and Florence Leonora Richardson, of Tynemouth, Northumberland. Buried in ST. ANDRE COMMUNAL CEMETERY, Nord, France. Row AA. Grave 11. Able Seaman, S.S. Scottish American, Merchant Navy. Died 4 April 1945. Aged 26. Son of William Chaptman Scott and Ann Scott, of Tynemouth. Buried in TYNEMOUTH (PRESTON) CEMETERY, Northumberland. Section J. Roman Catholic Grave 2773. Cook, S.S. British Yeoman (London) , Merchant Navy. Died 4 July 1942. Aged 25. Son of John Robert and Esther Seal; husband of Elizabeth Seal, of Tynemouth, Northumberland. No known grave. Commemorated on TOWER HILL MEMORIAL, London. Panel 21. Fireman and Trimmer, S.S. Stronsa Firth (Aberdeen), Merchant Navy. Died 28 November 1944. Aged 37. Son of Sidney and Elizabeth Sheldon; husband of Jane Irvin Sheldon, of Tynemouth, North Shields, Northumberland. No known grave. Commemorated on TOWER HILL MEMORIAL, London. Panel 104. Fireman and Trimmer, S.S. Empire Dryden (Sunderland), Merchant Navy. Died 23 April 1942. Aged 24. Son of Robert James Smith and Sara Nesbit Smith, of Tynemouth, North Shields, Northumberland. No known grave. Commemorated on TOWER HILL MEMORIAL, London. Panel 40. Leading Seaman LT/X19463A, H.M.S. Nile, Royal Naval Reserve (Patrol Service). Died 9 December 1942. Aged 34. Son of Robert Hardy Smith and Mary Smith, of Tynemouth, Northumberland; husband of Ida Smith. Buried in HELIOPOLIS WAR CEMETERY, Egypt. Plot 3. Row C. Grave 6. Aircraftman 1st Class 980969, Royal Air Force Volunteer Reserve. Died 11 November 1940. Aged 21. Son of George Alfred and Charlotte Hannah Thompson, of Tynemouth. Buried in NEWCASTLE-UPON-TYNE (ALL SAINTS) CEMETERY, Northumberland. Section J. Consecrated Grave 554. Cook, Steam Trawler Ben Screel (North Shields), Fishing Fleet. Died 25 December 1942. Aged 37. Son of George William and Mary Ann Towell; husband of Gladys Towell, of Tynemouth, Northumberland. No known grave. Commemorated on TOWER HILL MEMORIAL, London. Panel 123. Lieutenant 237937, King's Own Yorkshire Light Infantry attached to 1st Battalion, King's Shropshire Light Infantry. Died 24 April 1943. Aged 31. Son of Joseph and Catherine Tama Tyerman; husband of Constance Dorothy Tyerman, of Tynemouth, Northumberland. F.C.I.I. Buried in MASSICAULT WAR CEMETERY, Tunisia. Plot V. Row E. Grave 8. Sergeant 4269625, 1st Battalion, Royal Northumberland Fusiliers. Died 4 June 1942. Aged 27. Son of Joseph and Elseph Barbara Walker, of Tynemouth, Northumberland. Buried in ALEXANDRIA (HADRA) WAR MEMORIAL CEMETERY, Egypt. Plot 1. Row F. Grave 20. Able Seaman, S.S. Effna, Merchant Navy. Died 1 March 1941. Aged 26. Son of James Weatherstone, and of Elizabeth Weatherstone, of Tynemouth, Northumberland. No known grave. Commemorated on TOWER HILL MEMORIAL, London. Panel 37. Sergeant (Wireless Operator/Air Gunner) 1036493, 9 Squadron, Royal Air Force Volunteer Reserve. Died 18 November 1943. Aged 20. Son of Arthur Reginald and Evelyn Williamson, of Tynemouth, Northumberland. Buried in BERLIN 1939-1945 WAR CEMETERY, Berlin, Germany. Plot 9. Row F. Collective grave 18-25. Fourth Engineer Officer, M.V. San Emiliano (London), Merchant Navy. Died 9 August 1942. Aged 30. Son of Arthur and Esther Woodward; husband of Margery Elizabeth Woodward, of Tynemouth, Northumberland. No known grave. Commemorated on TOWER HILL MEMORIAL, London. Panel 92.